A simple and delicious favourite . Mix together the cooked beans, spring onions, chilli and celery. Whisk together the lemon juice and olive oil to make a dressing season with salt and pepper, and pour it over the salad. Set aside to marinate for 15 minutes. Drain the tuna fish and break into bite-sized chunks. 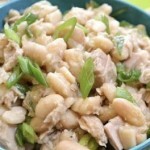 Stir the tuna and parsley into the bean salad. Tuna and bean salad 5 out of 5 based on 3 ratings.